For Halloween, I decided to cover some of the typical creatures we associate with this celebration - witches, skeletons, werewolves, mummies, and vampires. The first group of miniatures are 15mm witches from Chariot (MM01). There is one standing pose and two sitting poses with traditional pointy hats and long robes. The set comes with a shallow cauldron with separate legs. These miniatures are true 15mm figures, so will most likely be used as donors for future witchy projects. Representing skeletons, we have the Skeleton Recruiting Party from GFI (25980006). This set consists of a number of miniatures from the old Minifigs Valley of the Four Winds line. 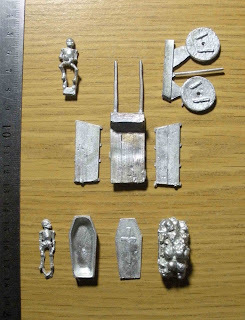 Shown below is the Dead Cart (VFW42) and the Coffin, Plain with Skeleton (VFWM4). The rest of the recruiting party consists of a Skeleton with Lantern (VFW120), a Skeleton Carrying Wine barrel (VFW118), and a Skeleton Carrying Basket of Skulls (VFW119). These are true 25mm figures, and full of character to boot. Except for their enormous heads, they are quite compatible with 1/72 figures. Next to the three GFI skeletons is an old Citadel Skeleton Warrior (FF52-1). He is a bit bulky, but also compatible with 1/72 with the exception of his huge head. Some unfortunate 15mm skeletons will have to donate their heads to make these guys suitable for my Army of the Dead. At the end is a plastic Caesar skeleton for comparison. It is my hope that one day, GFI will re-release all of the classic Minifigs skeletons, particularly the Great Bell and Tower that they use as a teaser for their pre-order thumbnail. There are a number of different werewolf types, which could be characterized along a continuum of increasingly wolf-like features. There is the old horror movie wolfman à la Lon Chaney Jr.; the man-wolves of The Howling; the werewolf in An American Werewolf in London; and finally, the man-transformed-to-actual-wolf of mythology. The first werewolf figure shown above is from Citadel (FF19). It has characteristics of both wolfman and man-wolf. It actually reminds me a bit of the big burly bear-wolves from the old Werewolf TV show. The next werewolf is from Ral Partha (ES61). It too has hybrid features, but it has the lean look that I associate with werewolves. After, is a 20mm werewolf from Elhiem (P28), followed by three 15mm Wolfen: the Wolfen Berserker (W006), Wolfen Shaman (W010), and Wolfen Spearman (W002). Though Wolfen are not proper werewolves, the Elhiem werewolf is clearly undersized, being no taller than the 15mm Wolfen. 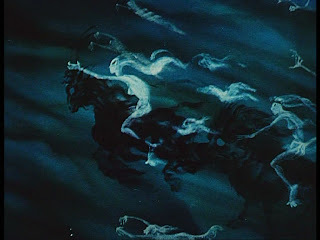 For me, werewolves should be tall, like Miss Lupescu of the Graveyard Book, or the Lycans of Underworld. Other than the Ral Partha werewolf, I'm not sure there are any other miniatures that meet my criteria. Most of the mummies shown above are of the old school Hammer Films style mummy. The first mummy is from the Grenadier Monsters boxed set (5002), followed by one by Ral Partha (ES20). These mummies are large and bulky. Totally unsuitable for 1/72 despite the preponderance of tall mummies in this scale. Next is version 1 of the Citadel Mummy (FF60). I believe that version 2 is identical to the Ral Partha version. I find this Citadel version superior to the Ral Partha version, though like most 25mm figures, the head is too big for 1/72. Next is the Elhiem Mummy (P28) which is slightly short, but fine. The last bunch are from Chariot (SHE06), which are tiny at 15mm. Vampires round out this entry, with The Count and Countess from Elhiem (P27), and a line up of Elhiem Vamps (P33). I'm not sure why The Count is so short, since he is obviously based off of the Bela Lugosi version of Dracula rather than Tom Cruise's Lestat. After all, Lugosi was supposed to have been 6' 1". A comparison of 1/72 vampires and mummies in plastic and metal. Great to see some of the old VFW figures again - that was a really interesting range. I see them on eBay now and then, but i've never bid on them since I feel it would be a shame to have to cut them up for conversions.